In recent weeks there have been several news stories about the ongoing tensions between the Vatican and American nuns. After the nuns had been criticized by the Vatican for paying too much attention to social issues and too little to doctrinal concerns, a group of nuns traveled to Rome to speak to leaders about what they felt were injustices in the report. According to the New York Times, “The group’s president, Sister Pat Farrell, said in a statement that during an “open meeting” the group’s representatives “were able to directly express” their concerns. The nuns said they would report back to the group’s board in the United States and determine a course of action to respond to the Vatican.” Americans of all religious persuasions, or none at all will be waiting to hear what the nuns’ course of action will be. For many people the confrontation between the nuns and the bishops will recall memories of Dorothy Day, a social activist who had no difficulty speaking up to bishops. Dorothy Day was not a nun, but she was an ardent Catholic and a founder of the Catholic Worker movement. A convert to Catholicism, Day decided in the late 1920s to give up secular journalism and start a newspaper devoted to social issues. Working with Peter Maurin, she founded the Catholic Worker paper, which started appearing at about the same time that the United States entered the Great Depression. The newspaper soon attracted not only a core of readers, but also a community of people bound by the ideals of social justice and peace. For several decades the Catholic Worker was a center of ideas and activism for many Catholics. The original house was in New York City and Dorothy’s work was always centered there. The workers were strongly pacifist all through the Second World War, which was an unpopular stance with many Catholics, both laypeople and clergy. After the war they demonstrated against the development of nuclear weapons and refused to participate in civil defense drills and other aspects of the 1950s. Dorothy Day and the Workers also strongly supported unions, which led to perhaps her most visible struggle with the Catholic hierarchy. When the gravediggers went on strike for higher wages, Cardinal Spellman, representing the Catholic Church that owned the cemeteries strongly opposed them. 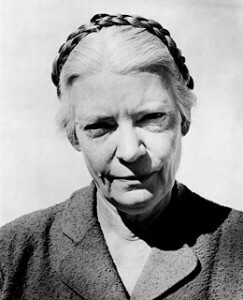 Dorothy Day and many of her supporters picketed with the strikers, who eventually lost the strike. At one point in this period, Dorothy Day was asked to go to the chancery office where a Monsignor told her she must change the name of the newspaper The Catholic Worker because it was not an official publication of the church. Dorothy discussed the matter with her colleagues and they did not comply with the request. Nothing ever came of the refusal and the Workers and the Cardinal continued in wary co-existence with one another for many years. [Cardinal Spellman] is our chief priest and confessor; he is our spiritual leader—of all of us who live here in New York. But he is not our ruler. He is not someone whose very word all Catholics must heed, whose every deed we must copy. As we watch watch the nuns today and their struggles with the way they practice their religious duties, we can hope that today’s Catholic women can also draw the line between following their faith and blindly obeying all the criticisms of the clergy.